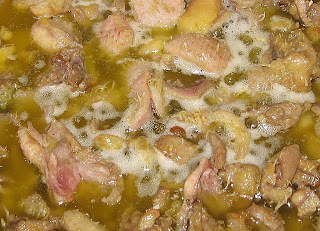 As I cut up the geese I rendered a lot of fat, too. A friend gave me these geese and I didn't want to butcher and pluck a half dozen geese. Without a mechanical plucker it's like being stuck in a Grimm's fairy tale. So, I went to the only butcher in the area that processes ducks and geese. Most meat processing plants don't like them because the feathers are hard to remove. In the picture of rendering fat, you can see little remains of pin feathers in a few pieces of skin.